Steampunk is an aesthetic style that imagines what modern machines might look like if materials such as aluminium, plastic and silicon weren't around and if technology was analogue rather than digital. It has its roots in science fiction of the 70s and 80s. Writers such as Michael Moorcock and Bruce Sterling looked back to the inventors of sci-fi, 19th century Victorian authors such as Jules Vernes and H.G. Wells, and began writing stories set in an alternative Victorian era. The modern authors imagined an era dramatically changed through the intervention of super-advanced science, essentially fusing modern inventions like the computer with the brass and steam of the 1800s. Verne and Wells wrote about trips to the moon, discoveries of dinosaurs, time machines and Martian invasions, but they did so in a manner which was strongly rooted in their present, so readers experienced terribly civilised Victorian trips to the moon, English gentlemen discovering dinosaurs, time machines with levers, gears and well upholstered seats and invasions from bally Martians! It’s this culture clash that made it such a distinctive and rich source to draw from. Steampunk may have started off as a sci-fi with a Victorian quirk but it has gathered momentum – due in no small part to its evocative but flexible name. The ‘punk’ in Steampunk is ignored by some, and emphasised by others; to some it means rebellion and fighting the authorities, to others an independent, DIY ethic and to yet more it’s just an unnecessary relic and simply a handy shorthand for retro-futuristic. The result is a crazy mix of brass fittings, cogs and gears along with aged wood, eerie lighting and antique parts scrounged from anything from old boiler parts to World War II battleships. Modders have been inspired to create everything from a wood-clad PS3 to keyboards, mice, LCD screens and complete PCs. 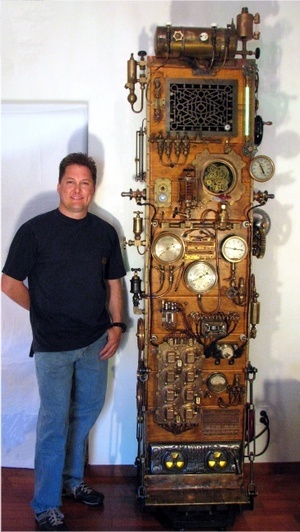 Dana Mattocks became hooked on the steampunk style when he first saw it in online forums in 2008 but somehow all the mods he saw weren't quite up to his standards. From his home in Arizona, he set about collecting the parts he needed for an absolute monster PC. We first saw his creation, Steampunk Frankenstein in a news report in February, and we've now got a full look at this massive mod. It sports fantastic attention to detail and standing at eight foot tall it dwarfs any other mod we've seen here at bit-tech too! Here's an exclusive insight into how Dana's Steampunk Frankenstein came into being. At the beginning of last year while browsing various PC modding sites (including bit-tech of course) I discovered a style gaining favour amongst various modders. Referred to as steampunk, it’s a strange, fictional take on what everyday machines might look like if modern materials such as aluminium and plastic hadn’t come into being. I loved how it looked because I adore brass gears, water valves, old gauges and the industrial era of steam engines, so I set about designing my own steampunk PC. Early on, I found that acquiring the old parts I needed was very difficult. I currently live in Arizona so antiques were nearly impossible to find locally, but I found eBay to be a valuable recourse. Ideas for the mods internals came from an article I remembered reading, which claimed it was possible to mount a computer on wood without the need for a full metal enclosure for it to operate properly. I decided upon the idea of building an open computer case that included an aluminium standard rack frame commonly used in business network systems to construct my computer. These racks are rated for mounting up to 450kg on them without any problems – something I felt might be useful if my plans came to fruition. The décor in my house leans toward distressed wood furniture so I wanted the PC to fit in as much as possible.